Each Edison robot comes with pre-set programs already loaded in the robot’s memory. To activate the program, you simply need to scan the correct barcode! The Edison robot barcodes activity book is the perfect way to get started with barcodes. 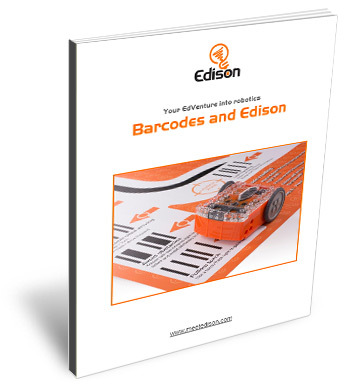 Explore Edison’s robotics capabilities with ease through the simple barcode programs included in this activity book. 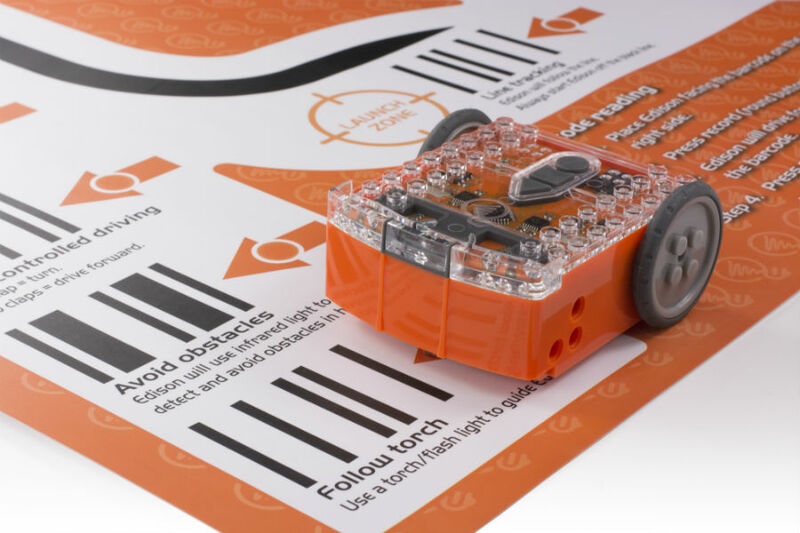 Work through the book and get your Edison robot to read the included special barcodes that activate pre-programmed features, such as line following, obstacle avoidance, sumo wrestling and much more! Different barcodes are used for different things, from running pre-set programs with Edison to pairing the robot to work along with one of the robotic programming languages and a TV or DVD remote control. The complete set includes all the pre-set program barcodes, the remote control driving barcodes, the programmable TV/DVD barcodes, and the calibration barcodes. Place Edison facing the barcode on the right side of the barcode. Always make sure the removable skid is in Edison and start the robot on a white surface just to the side of the barcode, not directly on the barcode. Wait while Edison drives forward and scans the barcode. The robot will stop driving after successfully scanning the barcode and make the success sound. What to do next depends on which barcodes you are using with Edison. Once you have successfully scanned one of the pre-set barcode programs (like ‘bounce in borders’ or ‘sumo wrestle’) you are ready to run the program. Press the play (triangle) button one time to run the program. When using any of the ‘remote control driving’ barcodes and pairing an Edison to a TV or DVD remote, you need to perform an additional step after successfully scanning the barcode. Once you have scanned one of the TV remote control barcodes, press the button on your TV remote that you want to match to that barcode’s action. When using these remote-control barcodes, you don’t press the play (triangle) button on Edison. Instead, press the button you just paired on the remote control. When Edison detects the remote code signal, the robot will perform that barcode’s action. When using any of the ‘remote control driving- programmable commands’ barcodes and pairing an Edison to a TV or DVD remote, you need to perform additional steps after successfully scanning the barcode. Once you have scanned one of the TV remote control barcodes, press the button on your TV remote that you want to match to that barcode’s action. You also need to write and download a program from one of the Edison programming languages that uses the corresponding remote control event. The program needs to tell Edison what to do if the robot detects the paired remote code. Play your downloaded program by pressing the play (triangle) button one time to run the program. While the program is running, press the button you just paired on the remote control. When Edison detects the remote code signal, the robot will perform whatever actions your downloaded program include for the robot when it detects that remote control event. Both the drive calibration and obstacle detection calibration barcodes allow you to perform specific maintenance on your Edison robot. When using either of the calibration barcodes, be sure to follow the instructions for that specific barcode. I'm having trouble scanning barcodes. What can I do? 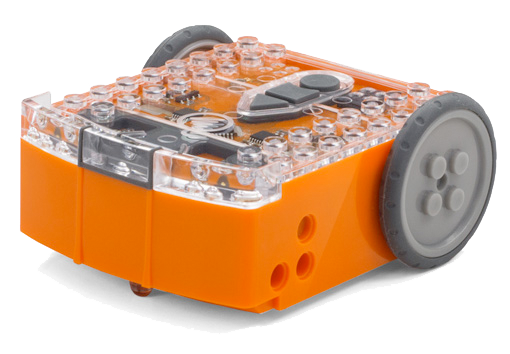 Check the batteries: The most common reason is low or flat batteries in the Edison robot. Try replacing the batteries and scanning the barcodes again. Check the paper surface: A glossy surface, including glossy finish lamination, will affect Edison’s sensors and may cause errors. Please ensure you use a matte finish if laminating barcode resources, including the EdMat. Check the paper’s weight: If the barcodes are printed on thin paper, Edison’s line tracker may pick up dark surfaces from underneath the paper, which can interfere with the barcode scanning. Try placing the paper with the barcodes on a white surface, for example, by adding a second piece of blank paper underneath the paper with the barcodes. Check the print: Do not change the size of the barcodes before printing them. Shrinking or enlarging the barcodes can affect how they will scan. Check the lighting: Bright, direct light, such as sunlight, can negatively affect Edison’s ability to scan barcodes correctly. Ensure that Edison and the barcodes are not in bright, direct light and that there are not heavy shadows on the paper with the barcodes. Do a drive calibration: Performing a drive calibration on your Edison can correct small issues in how Edison is driving, fixing issues scanning barcodes. Learn how to run a drive calibration here. Whenever you are running a program using Edison’s line tracking sensor (including ‘line tracking’, ‘bounce in borders’ and ‘sumo wrestle’) remember to always start Edison on the white surface, not the black surface. Edison’s line tracking sensor uses reflected light readings to find the difference between white and black surfaces. Edison takes an initial reading of reflected light against the surface the robot starts on. Edison then uses this reading as the reading of a reflective surface – it equates this as the brightest thing it will see. Edison then looks for a sharp drop-off in the reflected light readings it receives. The robot equates that sharp drop-off as being the non-reflective surface. If you start Edison on top of a black line, Edison reads that line as the ‘brightest thing’. When the robot then turns onto the white surface and gets a higher value, it doesn’t understand what is going on and ends up spinning on the spot. What barcode pre-set programs are there? Edison can also learn commands from TV/DVD remote controls using the remote control driving barcodes. What remote controls work with Edison? Edison is compatible with around 75% of TV and DVD remote controls. If one of your remotes doesn’t happen to work with Edison, try a different remote, preferably a different brand. Alternatively, you can purchase an inexpensive ‘universal remote’ and set it to be a Sony DVD remote control, which works well with the robots.